Leaving Haast was a day that my parents and Vera had been stressing out about, because it was the Day of the Big Hill (capitals added by me for emphasis). 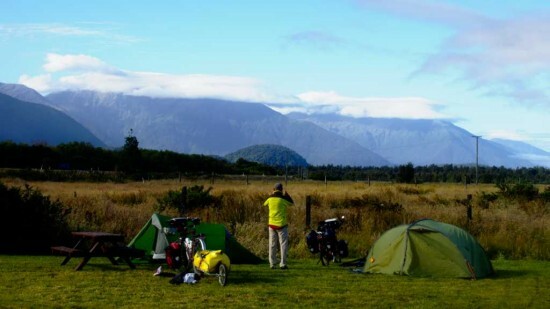 The plan was to ride over Haast Pass, ending the day at a dot on the map called Makarora, which is about 70 km from Haast. Mum was concerned about us not making it, so as a contingency plan we bought “emergency food” in Haast as well as stuff for lunch and snacks and so on. The emergency food was some of those rice instant meals, and the idea was that if we had to put up our tents by the side of the road in pouring rain or snow or whatever, we would have something to eat, even if it wasn’t particularly appealing. In the event that we did make it to Makarora, the emergency food was non perishable, so it could stay squashed down the bottom of a pannier more or less indefinitely. And so we left Haast. 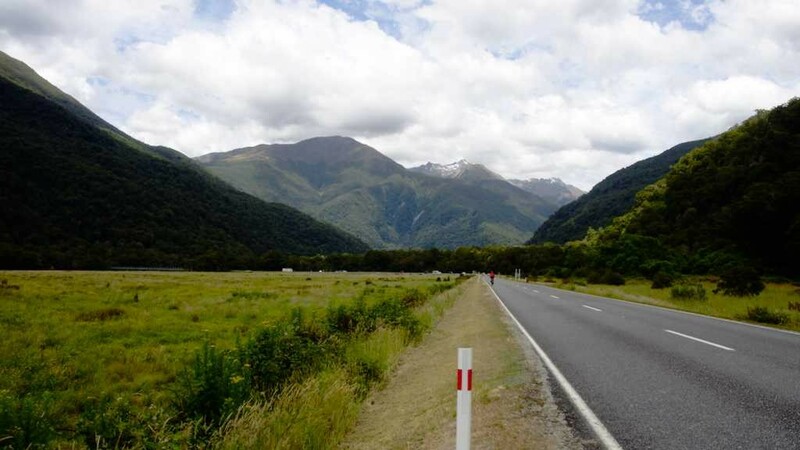 The first 30 km or so was pretty flat, riding along the wide, flat Haast valley; although on either side there were big high mountains. It was nice riding, and I found it particularly enjoyable because my flu symptoms had eased off dramatically, and I wasn’t feeling lethargic for the first time in a couple of days. 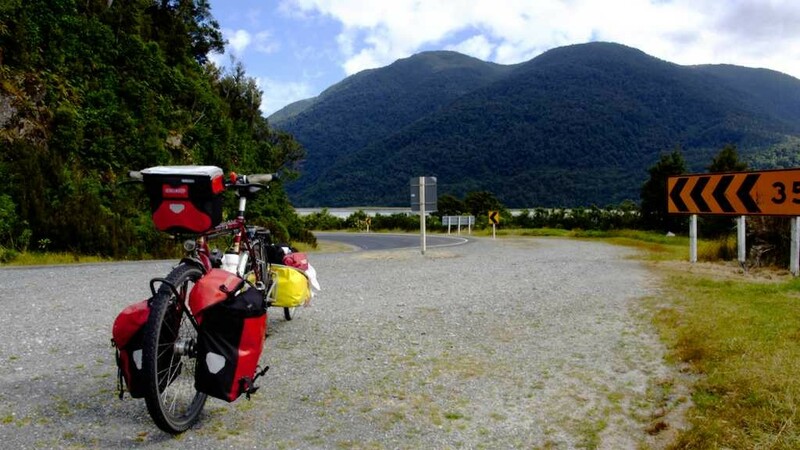 Perhaps my parents and Vera were feeling worse than I was: about 10 or 15 kms from Haast, we found Vera stopped with a van from an organised bike tour company. I’m not sure if he had stopped to offer, or if Vera had flagged him down and solicited for help, but he was offering to take our bags over the pass and drop them off at Makarora. Mum, Dad and Vera all started unloading panniers post haste, but I was too proud for that sort of thing, and besides, I wanted my camera, chair, food etc. along the way. 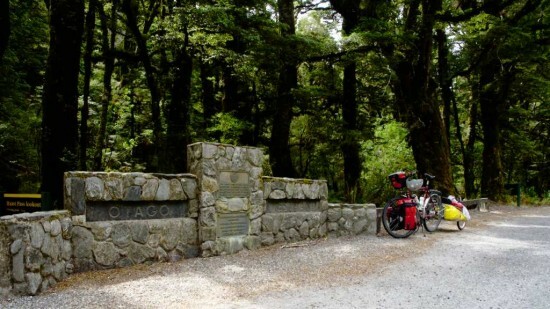 So, they all made use of the sag wagon and I was the only one on the trip to ride a loaded bike over Haast Pass. 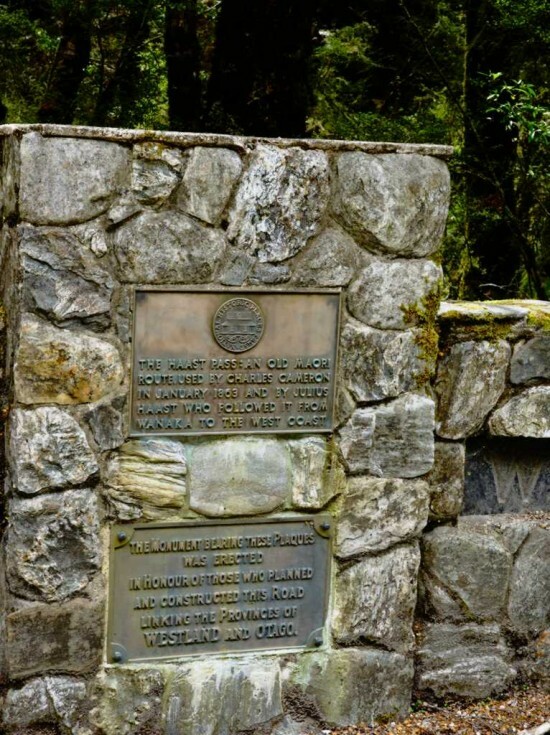 We had lunch at a picnic area called Pleasant Flat, after which the Big Hill began, where the van had arranged to stop so that my parents and Vera could get their food out of their bags. Perhaps it would be more appropriate to name it Blood Loss Gully or Transfusion Meadows though, because the air was absolutely thick with hungry sandflies. We slathered ourselves desperately with insect repellent, which did seem to have some effect. The sandflies also got stuck to the ball of the roll on bottle, and thus we discovered that they will drown in the repellent. By the way, after a few days with sandflies, you kind of dispense with the notion of killing them humanely. Anyway, I tried using my chair, but it was harder to swat the sandflies whilst sitting down, so we opted to eat lunch standing up. Did I mention I took my trailer? I like it because it is faster and easier to pack compared to rear panniers. It is also quite a lot of fun reversing it; I’ve now had some practice at it so I can do it quite well. The road itself was only constructed quite recently, in the 1960’s. 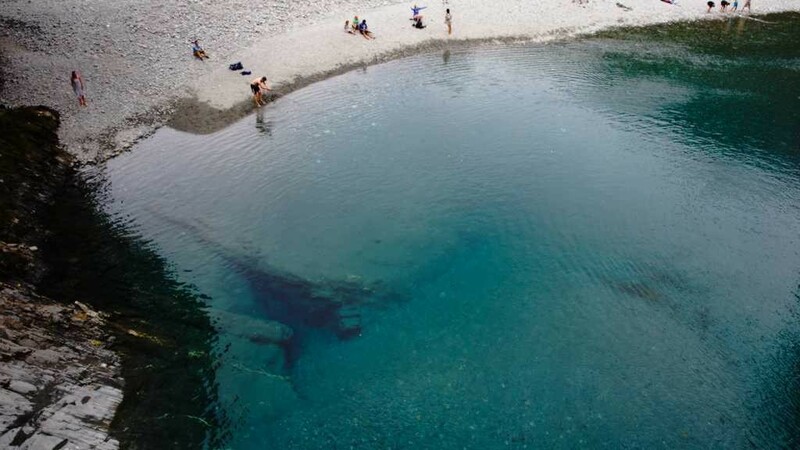 The blue pools were true to their name. 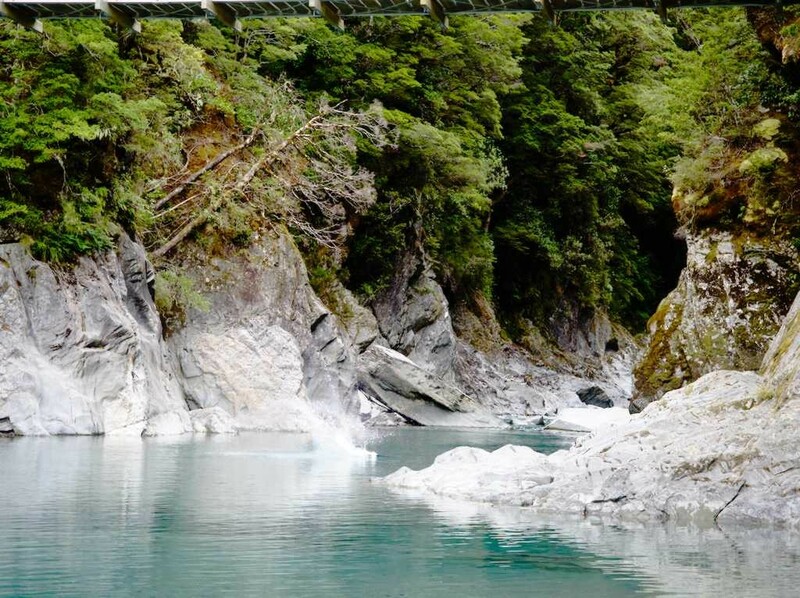 Some people were jumping into the frigid glacier water off a suspension bridge. 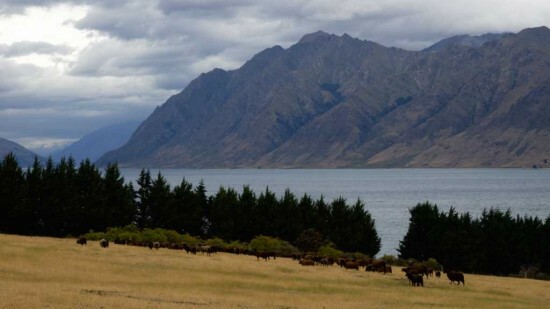 Black sheep at lake Hawea. 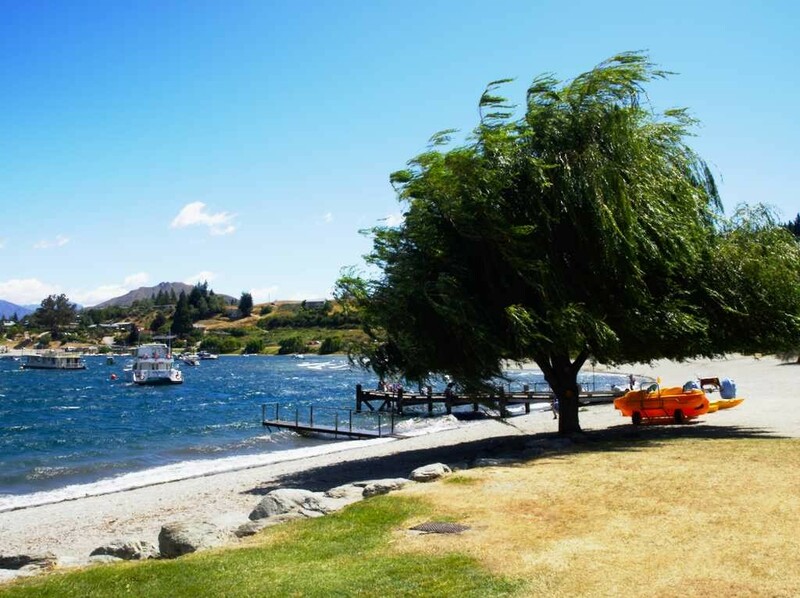 It was really windy when we were in Wanaka. Really windy. 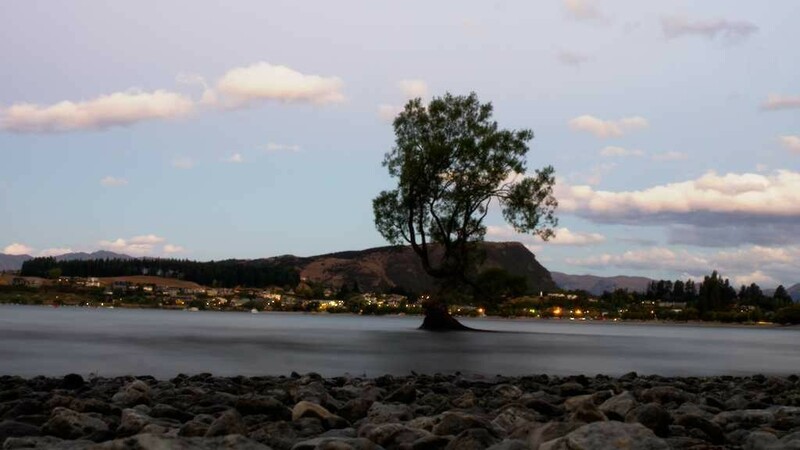 This is a tree growing near the shore of lake Wanaka, which is apparently very commonly photographed. It is not actually growing in the water, but on a tiny little island. After having a quick lunch, we continued up the Big Hill which we had been worrying about for days. Now, I had done some research before we left (ie, Google Maps; it has elevation profiles did you know? very useful) and so I knew that the pass itself is not really very high; about 600 meters. 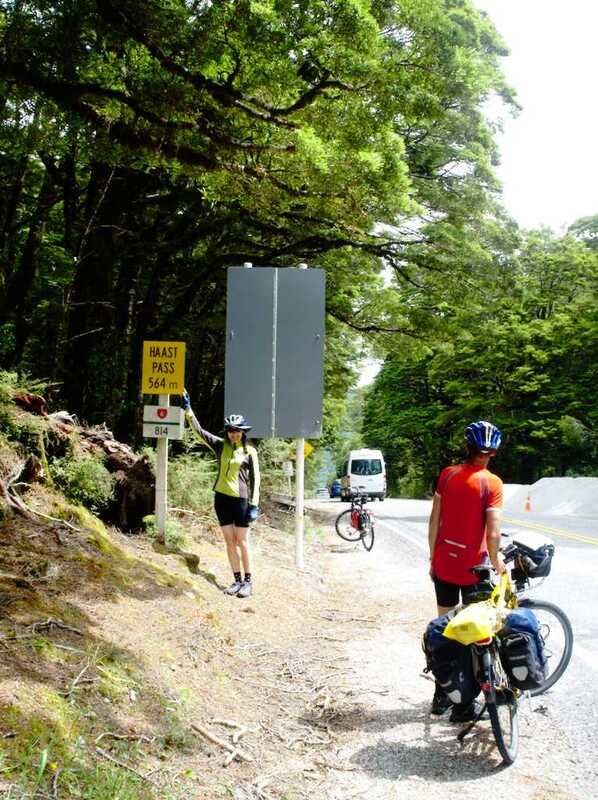 Given the distance from the start of the steep bit near some waterfalls called the Gates of Haast, the average gradient worked out to be about 8%. As it happened, the steepest section, at the Gates of Haast, is very steep indeed; I reckon it was about 15% or thereabouts for a good 3 km. Such hubris on my part, insisting on carrying all of my stuff. It was quite hard work even in first gear, and I stopped a few times to rest. Starting off on such a steep slope is also challenging, but a Rohloff hub is useful in that I could shift up to fourth gear to start (that way I could build up enough momentum with a single pedal stroke) and shortly after change back to first. Anyway, after that really steep section the rest of the way to the pass was not nearly as tough. There was also a noticeable change in vegetation between the coast and the pass: On the coast it is rainforest, with lots of tree ferns and moss all over the place, but at the pass the vegetation was beech trees. 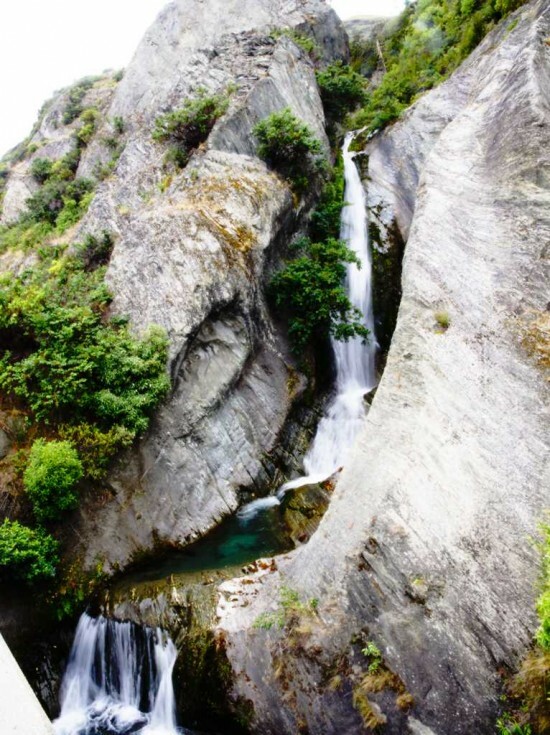 It actually reminded me quite a lot of various scenes in the Lord of the Rings movies, which makes sense really because the Lord of the Rings movies were filmed in the general area. 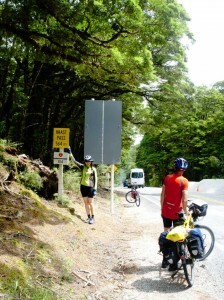 It was not down hill all the way from Haast Pass to Makarora. That almost never plays out, and when someone says “it’s all down hill from here”, I automatically translate to “down hill with lumps in it”. Which it was. On the way down, we stopped at the Blue Pools, which are logically blue as opposed to yellow. No ironic place names here. It was reasonably warm (25 degrees C) so I went for a swim. I sure wasn’t feeling hot after that; the water apparently comes out of a glacier, presumably one that wasn’t very far upstream because the water was absolutely frigid. 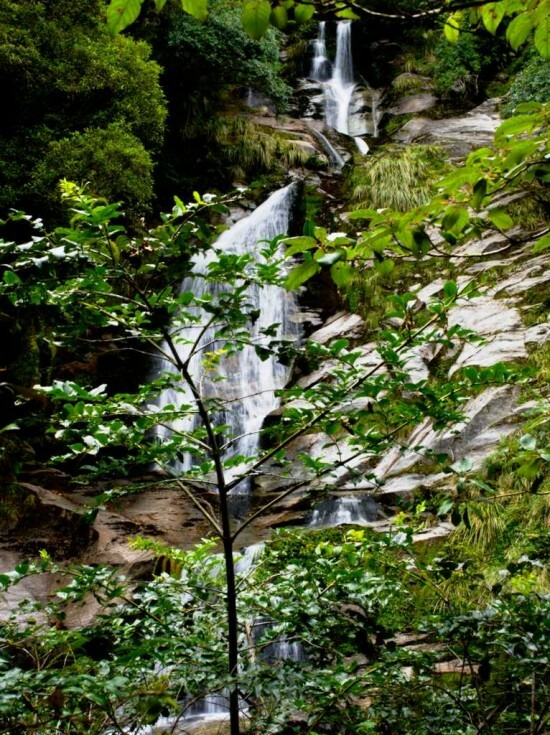 Some people refer to this kind of water as “spanner water”, so named after what a spanner might be used to tighten. We camped at Makarora with a few other cyclists from Germany and the UK, and best of all we seemed to have a reprieve from the sandflies, oh bliss! There were also quite a lot of sandfly corpses scattered around on the floor of my tent, which I found pleasing. When I went to bed though, I discovered that my feet had swollen up below all the bites around my ankles, which was a bit disconcerting. I began to agree with my parents and Vera that it would be a good idea to get some antihistamines when we got to Wanaka. After Makarora we rode south along lake Wanaka then across a pass to lake Hawea and eventually into Wanaka. It was very nice riding with the wind behind us, and a pleasantly cool temperature. The summer temperatures in the south island are generally quite mild compared to Australia. Anyway, Vera had left way before my parents and me (as you can see, a trend is becoming apparent here), so we didn’t see all that much of her in the morning, but we did manage to catch up to her before lunch. 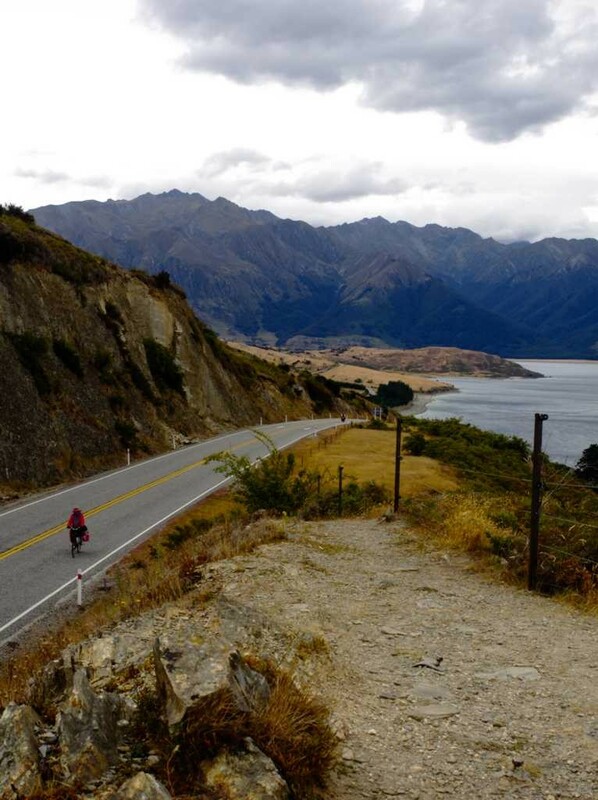 The road along lake Wanaka wasn’t very hilly; it tended to follow the lake shore for most of the way, but went over some short climbs to get over ridges. Between the two lakes there was a pass (well, I like to call it that; it sounds much more dramatic don’t you think) called The Neck, where the two lakes are quite close together, separated by a low gap in the mountain range. It was a fairly gentle climb though. 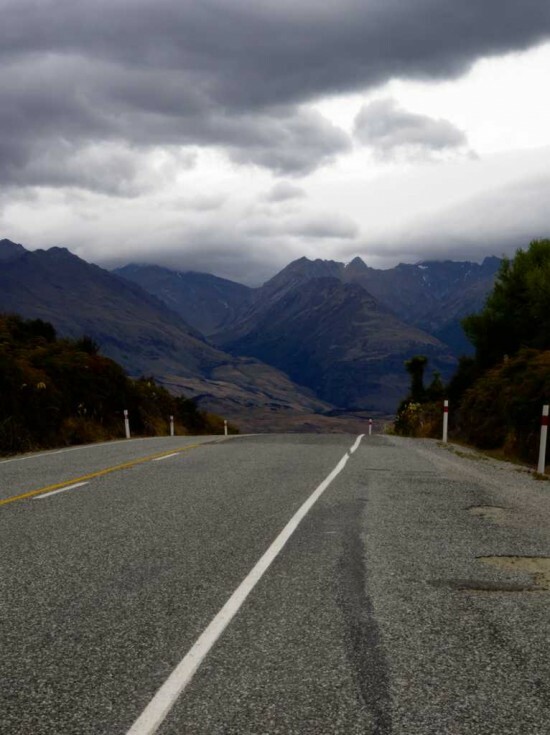 The road along lake Hawea was a bit more hilly; there were two climbs in particular that we could see from a fair way off which went straight up and over some humongous big ridge. Coming into Wanaka there was progressively more traffic as we got closer to the town center. We stopped at a cafe when we got there, and then planned what we would do next. We needed to find somewhere to sleep, and also Dad had been having issues with his phone, so he wanted to find the telco’s office and abuse them. In the end, we decided to go to the information center to sort these things out. So I followed Dad (not knowing where the information center was) and after a very short distance, I couldn’t see him anymore. I went back to the cafe and waited for a bit, then noticed a sign to the information center, went down there and… They weren’t there. I waited for some time there, and I had just gone in and found out where the caravan park was when Dad came back. 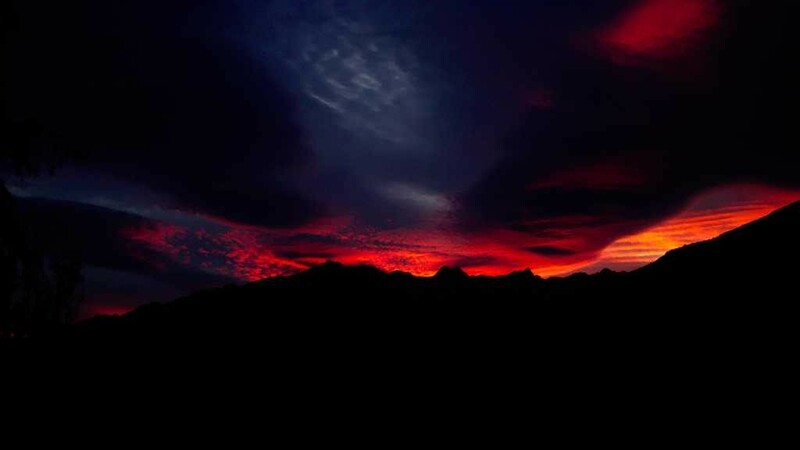 With regard to the antihistamines, that night I discovered that my puffy ankles had started to go down, and I was managing to refrain from scratching the bites, so I decided that I didn’t need antihistamines after all. My parents took some though; Mum’s legs were particularly spectacular, they looked almost like a case of smallpox. The next day was another rest day in Wanaka. My parents and me had been planning on doing some touristy thing while we were there; there was a glacier flight and walk that looked particularly interesting. There was a problem though: the wind was hideous. To such an extent that we had reservations about cycling around the lake due to the likelihood of being blown away. There were no flights either, so that ruled that out. There was also a jet boat tour and bush walk that we contemplated (the wind didn’t seem to bother them), but it was booked out, which was unfortunate. In the end we looked around the town and went for a walk around the lake (part of the way around it; it’s a big lake), but at least we did have a rest on our rest day. The wind also died down in the evening enough for me to get quite a good long exposure shot of the Wanaka Tree, which is a tree seemingly growing in the lake itself. It isn’t actually; there is a tiny little island and the tree grew on that, but you can’t tell from a distance. Well, that is the end of chapter 3. 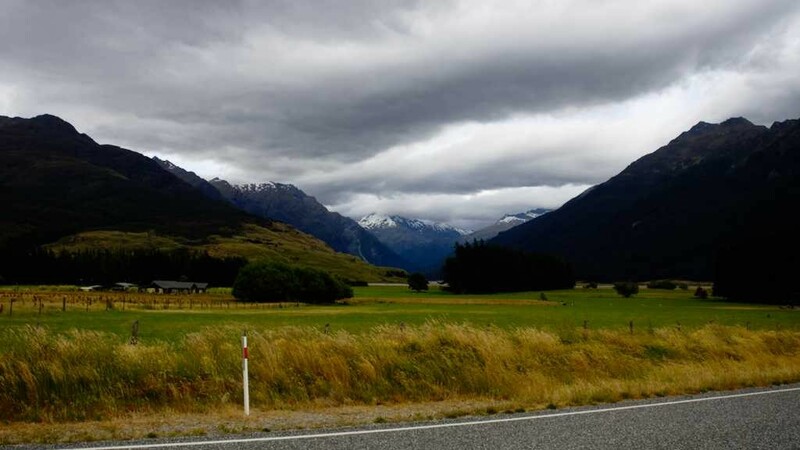 In chapter 4 we will continue on to Queenstown where we will do a few other touristy things, and Dad had an accident on the way. Cue groans from readers who are familiar with my Dad’s accident-prone past.